If you are missing most or all of your teeth and want an alternative to adhesive based dentures, implant-supported dentures may be the solution you are looking for. To restore full functionality and aesthetics to your smile, we at Ontario River Arch Dental, take pride in our ability to offer hybrid full arch bridges with Nobel Biocare’s All-on-4® technology. When you lose your smile, you lose the freedom to eat the foods you love, and the ability to express yourself genuinely. If you have adhesive based dentures, you have probably suffered from embarrassing slippage when eating or speaking. With All-on-4® dental implant process, our dentist is able to expedite the process for full arch restoration using only four posts that are longer, strategically placed, and sometimes tilted slightly for a better bond within the jawbone. This is extremely helpful when placing implants into bone that has lost volume, avoiding the need for bone grafts. Immediate Function - Patients who are candidates for All-on-4® can enjoy a fast road to a stable bite and beautiful smile. Our All-on-4® patients appreciate the full dental function this technology allows, like enjoying their favorite foods and expressing themselves openly. No Need for Bone Grafting – Even if you have lost bone volume due to your missing teeth, you can still qualify as a candidate without having to undergo bone grafting. By tilting the posterior implants and utilizing stronger areas of bone, a secure hold can be established. 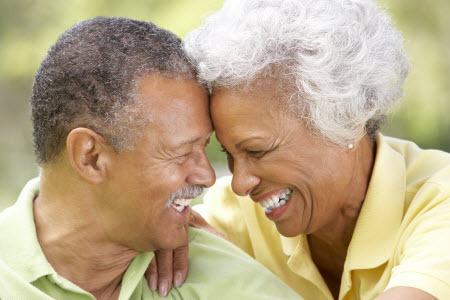 You will also never be without your smile as All-on-4® hybrid dentures are a permanent solution, and never need to be removed, except by your dentist if they become damaged, or need the rare cleaning. There are also no additional products to buy for cleaning your teeth. Just brush and floss as part of your regular dental care routine. While prosthetic teeth don’t decay, it is still important to care for them as you would your natural teeth. Implant-supported or hybrid dentures are a better option to restore the functionality of your smile. At Ontario River Arch Dental, we believe in providing a high standard of care through the All-on-4® treatment concept and other dental implants provided by Nobel Biocare. Our Ontario All-on-4 dentist is both trained and experienced in its application. If you are ready to address extensive tooth loss, call Dr. Lan T. Dinh at our dental office today!